This is very important for you people doing the Treasure Hunt. For instance – MY CLUE IS GLITTER. This Stampin' Up! product number's are: Dazzling Diamonds- 102023, Champagne Glass Glitter -120997, and Silver Glass Glitter -120995 – some fabulous bling for your cards, scrapbook pages, or other creative project. GATHER YOUR CLUES & ENTER TO WIN! Since you are stopping by these blogs, be sure to leave a nice comment about their blog, artwork, or ideas. I hope you have a chance to look at some of my blog entries/pages. Of course, I'd love for you to subscribe to my blog! more amazing projects or use some for inspiration. Sometimes poor quality images or lighting stop me but then I see something tote-fab that I didn't notice at first glance. This happens to me often. We tend to forget each and every project can be used as a map or layout. You can use those colors together or ribbon like that or stamping technique on your next creation! I slowly figured out how to swap out items and/or images I do not own and produce something that may or may not be similar. #3 Note the clue and whose blog you are on! or just Pin it to a Late Night Stampers Treasure Hunt Board on Pintrest if your into that. List each clue AND where you found it and remember to include your own name and address and website/blog/fb page/twitter whatever you're into or nothing if you're laying low. Entries will be check and included in the drawing for the grand prize! MAY 12TH is the deadline, at midnight. Winner announced May FIFTEEN on all blogs in the game! Right now we don't have 50 blogs participating but soon we will! Good morning everyone. I really dislike the weather we are having now. We are supposed to get 6 inches of snow today and then snow for the next 3 days. What happened to spring. I think we will skip spring this year and go straight to summer if this keeps up. Is it snowing or cold where you are? Today's card base is Whisper White Card Stock with Melon Mambo that I used the Scallop Edge Border Punch to scallop one side of it. I then layered Old Olive that I embossed using the Vine Street Embossing Folder. The flowers are made with the Secret Garden Stamps and punched with the Secret Garden Framelits. The center of the flower is Melon Mambo that I punched with one of the Itty Bitty Punch Shapes. I sprayed the flowers with Platinum Shipper Spray. I used the 2-way glue pen on all the edges of the flowers and then dipped them in Dazzling Diamonds. I wrapped Tangerine Tango ribbon around the top of the card. 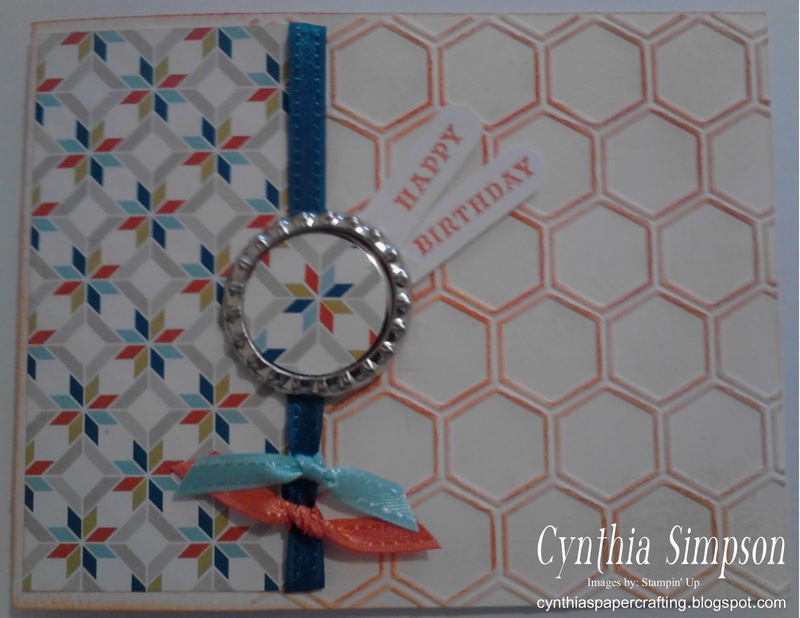 The label is stamped with the Pop Up Posies - Just For You - stamp with Melon Mambo ink on Tangerine Tango Card Stock, punched with the Apothecard Accents Framelits alond with the Melon Mambo border under the label. Thank you for visiting. Hope to see you again soon. Hi Everyone. Not much going on today. I did get to sleep in - until 8:30 - if you call that sleeping it. Well it was compared to the rest of the week with 5:30 wake up calls. 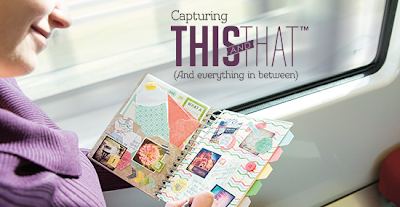 Stampin' Up has this brand new special, called This and That. I'm so excited about it, I can hardly wait to get it. Something NEW . . . from Stampin' Up! See the Flier HERE. Available TODAY . . . special pricing BUNDLE available TODAY! Today's card is a birthday card. 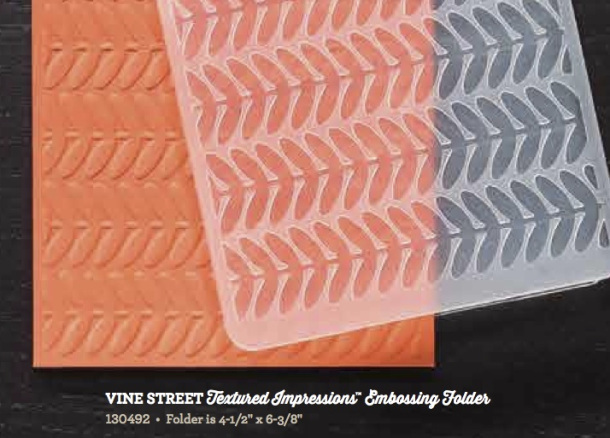 The base is Whisper White Card Stock that I embossed with the Honeycomb Embossing Folder and sponged Tangerine Tango Ink on the raised edges. I then layered a piece of the Sycamore Street Designer Series Paper. I used the Sycamore Street Ribbon and Button pack. I added a Soda Pop Top with a piece of the Sycamore Street Designer Series Paper punched and added to the middle of the soda top. 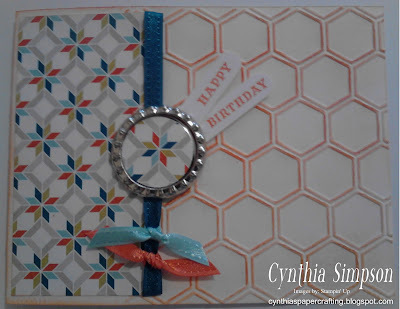 I stamped Happy Birthday in Tangerine Tango and punched it out with the Word Window Punch. I know Sale A Bration is over, but I still have a few cards left to show. Hope you don't mind. Don't forget about the Treasure Hunt. Glad today is Friday. Looking forward to sleeping in. Hubby been working overtime this week and have been getting up at 5:30 - sure makes for a long day and an even longer week. You know I think whoever made the calendars lied to us this year. It is now officially Spring, but it is still colder than the dickens here. The high for the next 5 days is in the 30's. That's not Spring to me. My card reminds me of Spring. Pretty flowers. I love flowers in the Spring. Haven't seen any here yet. The base of the card is Daffodil Delight. I then embossed Pacific Point Card Stock using the Framed Tulips Embossing Folder. I lightly sponged Illuminate Ink on the tulips. I layered Pumpkin Pie Designer Series Paper on next. 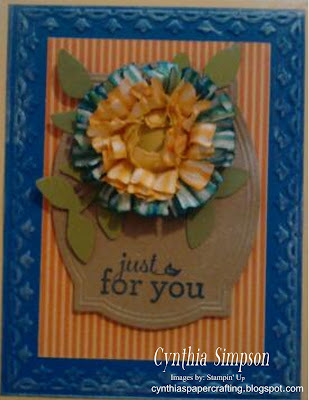 The flower and the background are part of the Pop Up Posies Designer Kit. I sponged Pacific Point, Pumpkin Pie, and Daffodil Delight ink on the flower. I added some leaves using the Secret Garden Framelits and Old Olive Card Stock. 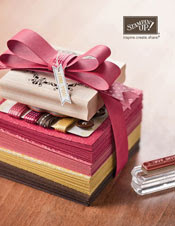 The stamp is Just For You stamped in Pacific Point ink and the stamp is also part of the Pop Up Posies Designer Kit. I then spayed the whole card in Frosted White Shimmer Spray. 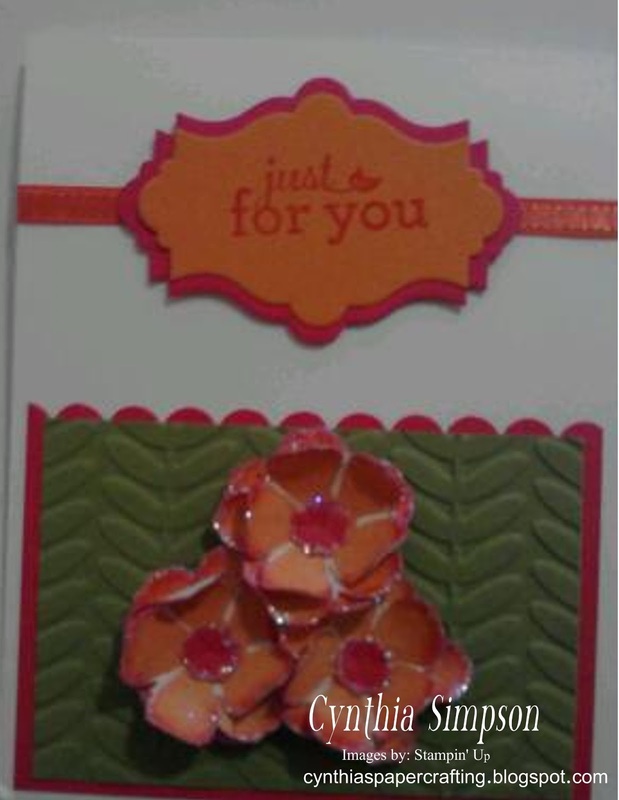 My passion is making cards and crafts using Stampin' Up products. If anyone is interested in acquiring Stampin' Up products, just send me an e-mail. Would love to hear from you. If you are interested in paper crafting and just want to hang out and craft with someone, give me a shout. I am always looking for new friends and people to have fun with. This is my personal blog. I am an Independent Stampin' Up! Demonstrator, and responsible for its content. Stampin' Up! does not endorse the use of or contents of the classes, services, or non-Stampin' Up! products I may offer here.